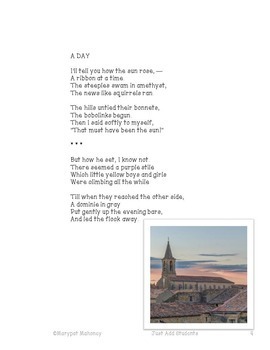 Your students will love analyzing this beautiful poem that describes the sunrise and sunset and then writing their own "I'll tell you..." poems. 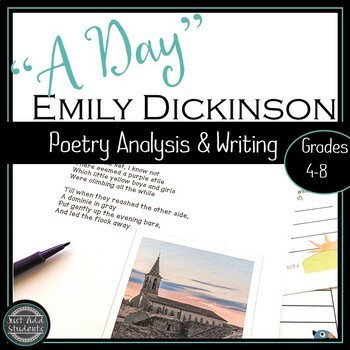 Students analyze the poem "A Day" by Emily Dickinson and write their own companion poem. Students use literary analysis skills and examine the vivid details that make this poem so beautiful. ✓ This poem is a wonderful gem! I love teaching Emily Dickinson's poems because students can understand and relate to them! Who hasn't been amazed by a beautiful sunrise or sunset?! ✓ Ready to use! Print and share with your students! 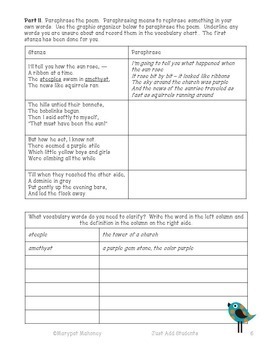 ✓ By writing their own "companion" "I'll Tell You..." poems that follow the same format at the original, students dig deeper into the poem's construction, practice using figures of speech, and experiment with rhythm and rhyme. ✓ Great for literature centers, creative writing, gifted and talented, and even your sub tub. 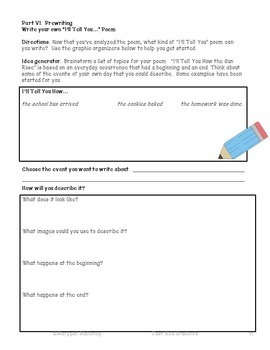 ✓ Step-by-step lesson makes it easy to teach poetry! Looking for more easy poetry lessons to share with your students? I would love for you to follow my store -- you'll be the first to hear about freebies, sales, and new products. Just click the green star next to my store name! I read and respond to all feedback -- plus you receive credit for future TPT purchases! Questions? Just send me a note through the Q&A below. I'll get right back to you!